Adopt PC/ABS ultrastrength material design,fine surface hardness,anti-impact. Ultrastrength material Frame Arms adopt PA66+30GF Ultrastrength material design, provide better crashworthiness. Integrated PCB wiringUsing high strength compound PCB frame board, which makes wiring of ESCs and battery more safe and easier. Optimized frame design, provides abundant assemble space for autopilot systems. 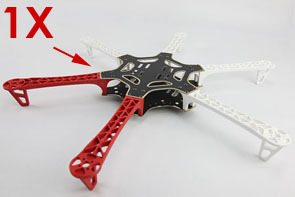 Gorgeous Frame Arms Provide different color frame arms: red, white, black, which makes your flight more colorful. 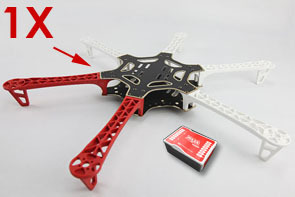 FlameWheel 550 series is multi-rotor frame designed for all pilots for fun or AP. 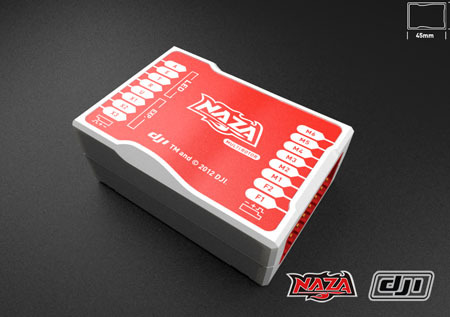 With DJI WKM or NAZA autopilot system, it can achieve hovering, cruising, even rolling and other flight elements. It can be applied for entertainment, aerial photography, FPV and other aeromodelling activities. All-in-One design. All-in-One Design integrates inner damping, controller, gyroscope, accelerometer and barometer, which simplifies installation and saves space. Advanced attitude stabilization algorithm. Advanced mix guidance algorithm and control algorithm, inherits outstanding flight stability of DJI products, provides excellent maneuverability, gives hobbyists wonderful flight experience. Low voltage protection. Two-level low voltage protection. low voltage LED alarm, and automatic landing. 2-axis Gimbal Stabilization. The gimbal stabilization module is compatible with almost all 2-axis gimbal systems. The system will adjust the gimbal and camera according to the attitude of the helicopter after setting the parameters the first time. 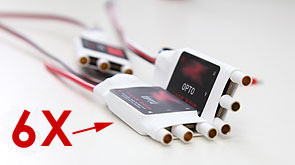 Upgradeable and extendible Easy firmware upgrade, extendible port for future use is available. Supported ESC output 400Hz refresh frequency. Recommended Transmitter PCM or 2.4GHz with minimum 4 channels. When flying, the fast rotating propellers of FlameWheel F550 will cause serious damage and injury. Therefore, please fly with a high safety consciousness. Keep flying multi-rotor away from objects, such as obstacles, human beings, high-voltage lines and so on. Do not get close to or even touch the working motors and propellers, which will cause serious injury. Do not over load the multi-rotor. 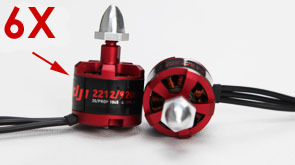 Check whether the propellers and the motors are installed correctly and firmly before flight. 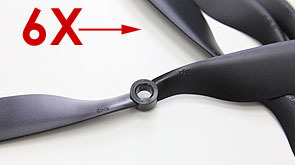 Make sure the rotation direction of each propeller is correct. Check whether all parts of multi-rotor are in good condition before flight. Do not fly with old or broken parts. Use DJI parts as much as possible. If you have any problem you cannot solve during installation, please contact our customer service.